Formulated to help support women’s health post-menopause. Combine’s 40 mg of Promensil’s standardised extract of Red clover isoflavones, with key nutrients to help support general health during post-menopause. Always read the label. Follow the directions for use. If symptoms persist consult your healthcare professional. Vitamins can only be of assistance if the dietary vitamin intake is inadequate. Contains soya and sulfites. Promensil Women’s Health is formulated with 40 mg of Promensil’s standardised extract of Red Clover isoflavones, plus key nutrients Coenzyme Q10, Vitamin D, Omega-3’s & Lutein to help support: a healthy heart, healthy bones and teeth, cognitive health & brain function, and healthy eyes. 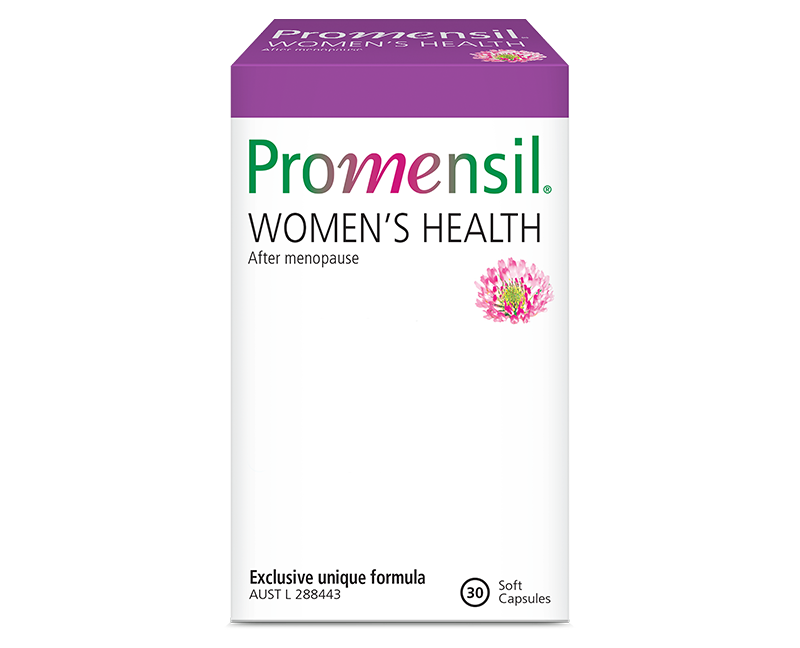 It is uniquely formulated to support women’s general health post menopause by combining Promensil’s Red Clover isoflavones, with other supportive ingredients. Promensil Women’s Health helps support your heart, bone, brain and eye health and general wellbeing during post-menopause. Promensil Women’s Health is formulated with 40 mg Red clover isoflavones to help boost daily intake of phytoestrogens in healthy post menopausal women, to help support general health and wellbeing. Who can benefit from Promensil Women’s Health? For women who want to support general health and wellbeing to assist a healthy, active lifestyle after menopause and beyond. Adults: Take 1 soft gel capsule each day with food, or as directed by your healthcare professional. Vitamins can only be of assistance if the dietary vitamin intake is inadequate. Do not take while on warfarin therapy without medical advice. Tagetes erecta (Marigold) flower ext. dry conc. std.